On 19 February, the Taiwanese President Tsai Ing-wen announced her plans to seek re-election in 2020. In an unexpected move, she made her plans public on CNN, rather than in her native Taipei. Whilst the move created confusion amongst her compatriots, it can be interpreted as the need to portray herself as America’s ally, and someone who has American support. In light of losing seats in the end of 2018, it is likely that Tsai’s campaign will be focussed on challenging Mainland China’s threats. When Taiwanese President Tsai Ing-wen announced her plans to seek re-election next year, she didn’t stage a rally in Taipei or stream a speech in Chinese over social media. She chose to go on CNN. Speaking in English, Tsai’s interview Feb. 19 highlighted the complicated three-way politics in the 100-mile-wide Taiwan Strait, one of the most militarized flash points in the world. 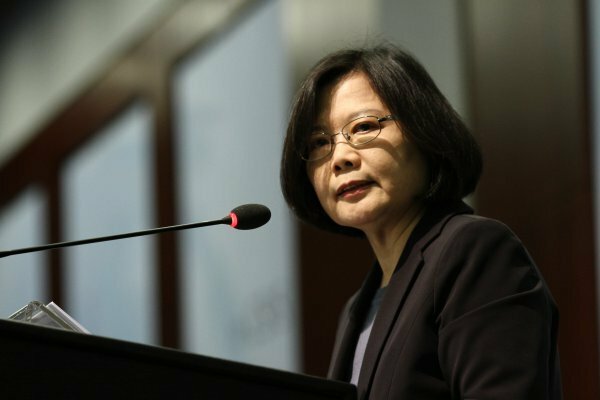 For years, officials in Washington — which is treaty-bound to defend Taiwan against Chinese aggression — viewed Tsai with skepticism, if not outright concern. Now, the political calculus may be shifting at a time when the United States is stepping up its global competition against Beijing. Her Democratic Progressive Party does not recognize a “one-China” framework that Beijing considers inviolable, and it leans toward declaring formal independence from China — a provocative move that would potentially spark a devastating conflict that also pulls in the United States. But the Washington of today — with a Trump administration staffed by China hawks in several key positions — has warmed up to a woman who is anathema to Beijing. And that, analysts say, may have been the message Tsai sought to convey when she sat down with CNN to portray her democratic island as a bulwark against Chinese expansionism. Taiwanese voters are facing a pressing choice between continuing with Tsai or choosing one of several contenders from the Kuomintang opposition party, which seeks a detente with Beijing. Since electing Tsai in 2016, the island of 24 million people has been caught in the vise of a Chinese economic and diplomatic pressure campaign designed to punish Tsai’s party. Chinese President Xi Jinping opened this year with a significant speech that amounted to an ultimatum. Acknowledge there is only “one China” and come to the table for unification talks, Xi suggested, or wither. Xi warned that China — which has an estimated 1,500 missiles pointed at Taiwan — prefers to peacefully absorb the island, which split from China amid civil war in 1949, but it would not rule out using military force. Speaking to reporters this week, Tsai maintained that Taiwan wanted an “independent existence” and said her country should seek allies abroad to counter its giant neighbor rather than appease it. Her pitch, however, may not get much traction. Tsai’s party was dealt heavy defeats in local elections in November, and Tsai is lagging behind potential challengers who favor closer ties to China, according to opinion polls by National Chengchi University’s Election Study Center and Shih Hsin University. Her chief opponents are Eric Chu and Han Kuo-yu of the opposition Kuomintang (KMT), and Ko Wen-je, the independent mayor of Taipei. The KMT’s chair, Wu Den-yih, said last week his party would seek a peace treaty with Beijing if it won the presidency in January. In an interview with Voice of America that aired last week, he urged Taiwan to not ruffle China’s feathers — or get too cozy with the United States. A robber can’t go to the bank and steal money “without worrying about the police,” he said in an apparent reference to Taiwan getting help from Washington. Several candidates are beating a path to the U.S. capital, a traditional step for Taiwanese contenders to show they have American support. Ko, the independent, plans to visit Washington in March. The KMT’s Chu is on a whirlwind tour through California this week and expected to eventually visit the East Coast. Another potential KMT candidate, former president Ma Ying-jeou, will swing through Washington in April. But the United States appears to be “warming up to the Tsai’s [party], because of its new competition policy toward China,” said Zhang Baohui, a professor at Lingnan University in Hong Kong. “They don’t want [her Democratic Progress Party] to start troubles but they also think they might be a more willing partner to help challenge China,” Zhang added. A month after his victory in the 2016 election, President Trump took a congratulatory call from Tsai, breaking with decades of diplomatic tradition that prevented direct contact between the two countries’ leaders. His administration also signed a bill last year January allowing high-level U.S. officials to visit Taiwan. Weeks later, State Department official Alex Wong traveled to Taipei to deliver a speech that irked Beijing. Days after last November’s election in Taiwan, U.S. Navy warships steamed through the Taiwan Strait. “There is more discussion in the government about Taiwan than ever before on a range of issues, from economic to defense to diplomatic,” said Bonnie Glaser of the Center for Strategic and International Studies. U.S. officials are open to deepening trade ties with Taiwan, although it’s not clear that Tsai has the domestic political capital to close deals, Glaser added. Taiwan’s campaign season will play out under a cloud of high tension. “China is getting impatient about lack of progress on Taiwan and there are plenty of indicators of that, in the rhetorical arena but also in terms of ongoing military preparations and pressures put on Taiwan internationally,” said Jonathan Sullivan of Nottingham University. Xi has expressed reluctance to let the “Taiwan problem” be “passed down from generation to generation” and has framed the assertion of Chinese territorial claims as central to his mission of restoring China’s national greatness. The Chinese leader has ushered along a vast military modernization campaign aimed at taking Taiwan, encircled the island with bombers and ships in displays of force and urged his commanders to prepare for combat. U.S. defense intelligence officials said last month they were concerned that the Chinese military’s upgrades were approaching the point where its commanders may tell Xi that they are confident they could successfully invade Taiwan. In an editorial on Wednesday, the Chinese Communist Party-run Global Times newspaper warned Tsai against “wicked tricks” on the campaign trail — referring to the possibility that she might stoke pro-independence fervour to win votes.